1928-29 Open Car Wind wing clamp Set. Chrome plated clamp Set for the wind wing glass. Comes with glass patterns. Price is for a kit that is enough for both sides of the car. 1930-31 Open Car Wind wing clamp Set. 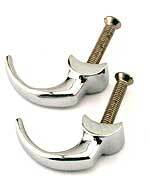 Chrome plated clamp set for the wind wing glass. Comes with glass patterns. Price is for a kit that is enough for both sides of the car. 1928-31 Closed Car Wind Wing Clamp Set. Chrome plated clamp set for the wind wing glass. Comes with glass patterns. Price is for a kit that is enough for both sides of the car. 1928-29 Open Car Wind Wing Glass. Set of 2. 1930-31 standard roadster or phaeton wind wing glass. Set of 2. Note: the standard models have a taller windscreen than the deluxe models, so please make sure that you order the correct glass for your car. Do you have a Standard or a Deluxe 1930-31 Model A? Standard car windshield height is 15 1/4". Deluxe car windshield height is 13 1/2"
1930-31 Deluxe roadster or phaeton wind wing glass. Set of 2. Wind wing pad set for original wind wing brackets. These pads are designed to fit the original wind wing brackets that have the relief in the bracket. If you have the early repro version, with the relief on one side and a smooth edge on the other, you might need to order both pad sets. These can be used on reproduction clamps if the raised portion is shaved off. Wind wing pad set for reproduction wind wing brackets. These are the flat style wind wing pads that were originally used on the 1930-31 Open Cars, but they will also fit 1928-29 Open Cars with the reproduction wind wing brackets. One set will do both sides. The spring washer that goes under the head of the locking bolt. Set of 4. Made in USA. Glass bedding 1928-31 Open Cars. Black rubber for sealing the glass to the windshield frame. Give a light coat of oil when installing and rubber will swell to make a nice tight seal. Made in USA. 1928-29 Plain Steel Windshield Stanchion. Authentic reproduction made of stamped steel for the 1928-29 Phaeton, Roadster and Roadster Pick-up. Sold in pairs. Made in USA. 1928-29 Stainless Steel Windshield Stanchion Set. Authentic reproduction made of stainless steel for the 1928-29 Phaeton, Roadster and Roadster Pick-up. Sold in pairs. Made in USA. 1930-31 Plain Steel Windshield Stanchions for authenticity on the Standard Roadsters, and on the Roadster Pick-up. These are made of regular steel so that you can paint them as original. Set of 2. Made in USA. 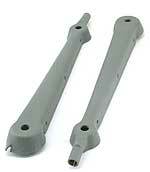 1930-31 Stainless Steel Windshield Stanchion set for the 1930-31 Standard Roadster. Set of 2. Stainless steel stanchion set for the 1930-31 Deluxe Roadster. This one is drilled only on the left side for the mirror. Complete with sockets and the post liner. Set of 2. Drilled both sides for the mirror attachments. Complete with sockets and the post liner. Set of 2. The inside liner for the windshield stanchions of standard 1930-31 open cars. If ordering new stanchions, these will already be in them. Made in USA. The inside liner for the windshield stanchions of Deluxe 1930-31 open cars. If ordering new stanchions, these will already be in them. Made in USA. Pressed steel stanchion for the 1930-31 Standard and Deluxe Roadsters. All were painted originally. Sold in pairs only. Made in USA. Polished Stainless Lower Stanchions for the 1930-31 Standard and Deluxe Roadsters. Sold in pairs only. Made in USA. Fine thread Stanchion screws for the 1929-30 models. A set of 4 screws that hold the windshield stanchions to the body. Made in USA. Stanchion screws for the 1931 models. A set of 4 screws that hold the windshield stanchions to the body. This style has the hex with a screwdriver slot. Made in USA. Coarse thread Stanchion screws for the 1928-29 models. A set of 4 screws that hold the windshield stanchions to the body. Made in USA. These bronze castings are used on all Roadsters, Roadster Pickups, and Phaetons. They go at the top of the cowl. These are what the stanchion screws that hold the lower stanchions screw into. Set of 2. Made in USA. Lead spacer used between the dash rail and the lower stanchion. Come molded in a pair, so you will have to break them apart at the seam. Set of 2. Made in USA. The lower steel cup-like sockets mounted in the stanchion. If you are ordering new stanchions, these will already be installed in them. Made in USA. Sold each. The upper steel cup-like sockets mounted in the stanchion. If you are ordering new stanchions, these will already be installed in them. Made in USA. Finger pulls for the 1928-36 open cars. Mount on the lower windshield frame for pulling it shut. Set of 2. Frame Cone for the 1930-31 cars in Chrome. Goes between windshield frame and windshield stanchionsat the pivot point. Open cars only. They are a quality American made cone with the proper taper. Made in USA. Sold each. Frame Cone for the 1928-31 cars in plain steel. Goes between windshield frame and windshield stanchionsat the pivot point. Open cars only. They are a quality American made cone with the proper taper. Made in USA. 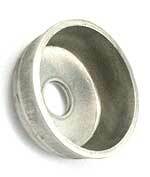 Windshield Stud for the 1928-31 Model A. Open cars used these studs where the windshield pivoted. The special thin cone shaped nut for holding the frame cone is included. Made in USA. Used on the open car windshield. 1928-31 uses them at the top where the windshield pivots, and the 1930-31's uses them to attach the upper stanchion to the lower stanchion. Size 3/8-24 thread. The 1928-29 cars need 2 of these and 4 for the 1930-31 cars. The rubber gaskets needed for the windshield of the open cars. This 1928-29 kit includes the strip of rubber that gets installed in the windshield stanchion plus the one for the bottom of the screen. Made in USA. The rubber gaskets needed for the windshield of the open cars. This 1930-31 kit measures 1"x46" and 1/2"x32". 1928-29 Plain Windshield Frame, made from the original round tubing. Plain steel to be painted, for the 1928-29 open cars & trucks. Made in USA. Chrome Windshield Frame, made from the original round tubing. For the 1928-29 open cars & trucks. 1930-31 Plain Windshield Frame, made from the original round tubing, for the 1930-31 standard open cars & trucks. 1930-31 Chrome Windshield Frame, made from the original round tubing, for the 1930-31 open cars & trucks. Made in USA. For the 1930-31 Deluxe open cars. 1930-31 Chrome Deluxe windshield Frame, made from the original round tubing, for the 1930-31 Deluxe open cars.